While going through some information that I had squirreled away for my gold rush book I ran across some photo’s of this Hutchings Dyspepsia Bitters. This bottle was recovered from a long gone gold rush town in Northern Sierra County by AH, a long time digger and collector from Nevada City. I don’t recall ever hearing of another Hutchings being found here in Sierra County. The Hutchings is a rectangular shaped bottle that comes in aqua colored glass with an open pontil base. These bottles are pretty early and date from the beginning 1850’s and are considered rare. 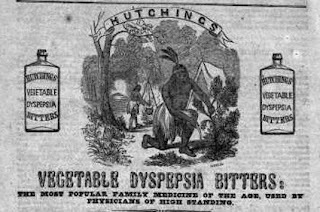 Dyspepsia was as common a medical condition in the 1850’s as it is today. Known as upset stomach or indigestion it is characterized by chronic or recurrent pain in the upper abdomen and feeling full earlier than expected when eating. Almost every bitters manufacturer claimed that their product would cure dyspepsia and several used the actual word dyspe psia as part of the name of their product. Although this product was not manufactured on the west coast evidence indicates that it was distributed here in the Sierra’s during the California gold rush. Anybody out there discovered any other Hutchings here in Northern California?